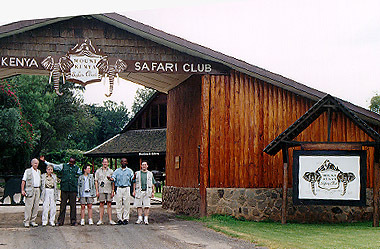 Mount Kenya Safari Club is a famous resort at the base of Mount Kenya. The club sits directly on the equator and is about 7000 ft in elevation. 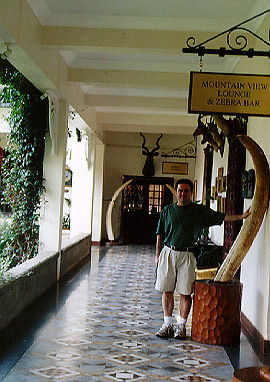 It was built as a residence during the 1930's, then converted to a luxury hotel and hunting lodge. Several movies were filmed here during the 50's and 60's. 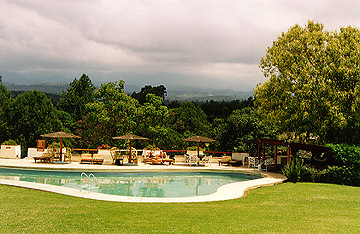 William Holden stayed there while on safari in 1959 and liked it so much, he bought the place. 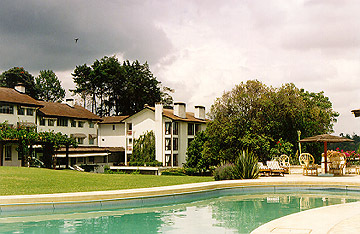 Currently owned by Lonrho hotels, the club has a golf course, animal orphanage, tennis courts, horseback riding and hiking trails. I spent two nights here with the rest of the group and enjoyed hiking some of the trails and observing the many birds. Some of them, especially the Sacred Ibis are quite tame. I didn't have time to play tennis or golf between our trip to Samburu and the El Nino storms. Dinners were lavish and somewhat formal affairs and the staff prepared a fire in each room by the end of dinner as part of the turn-down service. 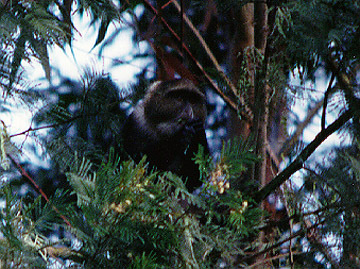 This blue monkey is part of a group looking for food in the trees by some of the Mt. 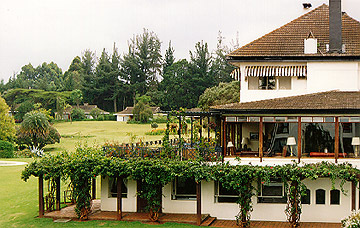 Kenya Safari Club cottages. A nice view from the balcony.